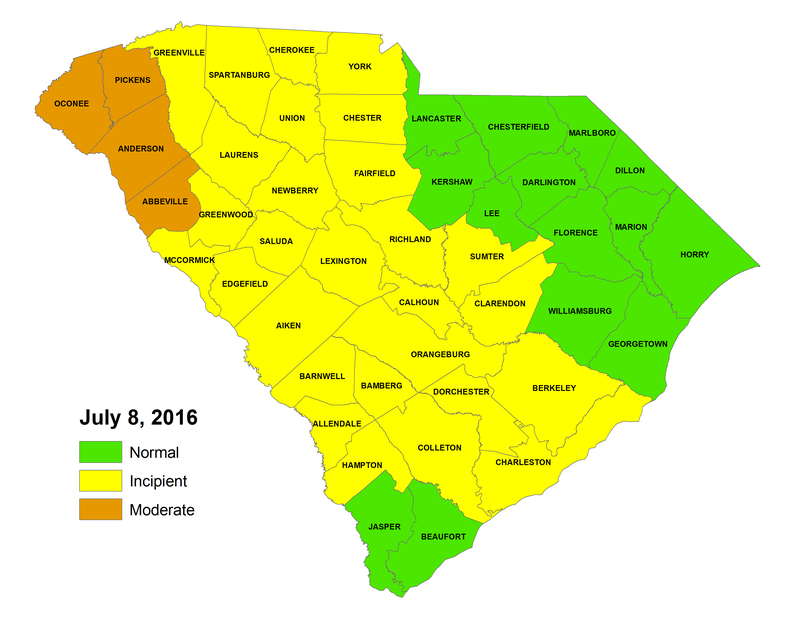 The S.C. Drought Response Committee, meeting via conference call on July 8, 2016, upgraded the drought status for 32 South Carolina counties (see map). Twenty eight counties were upgraded to the first level of drought, "incipient," and four counties were upgraded to "moderate," the second level of drought. 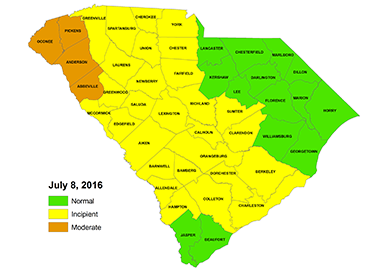 Beaufort and Jasper, and counties in the Pee Dee Region remain in "normal," or non-drought condition. According to State Climatologist Hope Mizzell, most counties in South Carolina have seen above average temperatures and below average rainfall during the past month, with few exceptions. "The majority of the state has been dry and hot," said Mizzell. "Counties that were not upgraded have received near normal amounts of rainfall over the last 30 days." "I've been on the drought committee a long time, and I've never seen a drought cycle develop and deteriorate so quickly," said Dennis Chastain, a well-known naturalist and West Area Drought Committee member from Pickens. "In my opinion three things account for this; the rainfall deficit, the abnormally high temperatures and the wind, which has significantly increased evaporation. All three factors have worked together to quickly exasperate the drought." In Upstate areas hit hard in recent weeks by higher temperatures and lack of rainfall, some crops are withering, and the first cutting of hay has been poor, reported committee member Brad Boozer, who represents the S.C. Department of Agriculture. Boozer described hearing from row crop farmers in some areas of the state that late-planted fields of corn and soybeans have, in some cases, failed to germinate due to lack of rainfall, and from some Upstate farmers who reported purchasing hay for livestock due to the lack of available grass. Such agriculture-related concerns prompted committee members to take the somewhat unusual step of moving Pickens, Oconee, Anderson and Abbeville counties directly into moderate status, skipping the typical lower-level stage of "incipient." According to Blake Badger, with the U.S. Dept. of Agriculture's Farm Service Agency, pasture conditions are deteriorating further, resulting in some producers reducing cattle inventory. Several meeting participants expressed concern over the long-term availability of hay for livestock feeding. The table below provides selected station rainfall totals and departure from normal values for the period June 1 – July 8. According to Mizzell, extreme temperatures, which increase evapotranspiration and cause low and decreasing soil moisture, can create a situation that is often referred to as a "flash drought." A flash drought develops rapidly with impacts observed quickly, especially to agriculture. Daryl Jones, S.C. Forestry Commission Forest Protection Chief, reported that since late June, fire ignitions have been increasing and the SCFC is preparing for an active late summer to early fall fire season. Scott Harder, a hydrologist with the DNR, advised the committee that the recent below normal rainfall has led to notable declines in streamflow levels in the declared counties. The drop in streamflow combined with the increased evaporation from above normal temperatures has also caused small, but ongoing declines in reservoir levels in the Saluda and Savannah Basins. According to National Weather Service Senior Hydrologist/ Meteorologist Leonard Vaughan, the short term forecast calls for temperatures to remain above normal with little to no improvement in rainfall chances across the Palmetto State for the next one to two weeks. There was discussion and recognition by the committee following the water system status report provided by S.C. Dept. of Health and Environmental Control Bureau of Water Chief David Baize, that thankfully at this point, there have been no reports of drought-related water supply problems. The primary impacts at this point are to agriculture, with an increasing concern for wildfires. The committee will continue to monitor the situation closely and if conditions deteriorate the DNR's Office of State Climatology will reconvene the committee as needed.